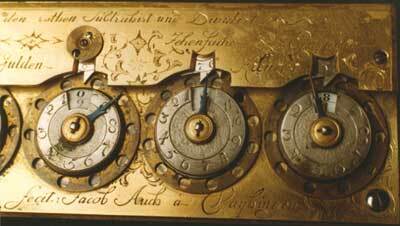 The German Jacob Auch (1765-1842) was a very good mechanic and clock-maker (see biography of Jacob Auch), interesting for us with his remarkable calculating machine. Auch was born in Echterdingen, a small town near Stuttgart. In the same town, from 1781 till 1790 served Philipp Matthäus Hahn. The young Jacob was an apprentice of Hahn and used to work in his workshop in Echterdingen. From 1787 till 1798 Auch opened and worked in his own workshop in Vaihingen an der Enz and Karlsruhe, and from 1798 till 1842 he was hired as a Ducal Mechanic (Großherzoglichen Hofmechanicus) at the Weimar court. During the years 1789 and 1790, while in Vaihingen an der Enz, Jacob Auch made several adding machines of a very good workmanship. He was most probably inspired by the adding machine of his mentor Hahn, as its construction is quite similar, but with an improved tens-carry mechanism. It is unknown how many machines have been produced by Auch, but at least three survived to our time—in Württembergisches Landesmuseum in Stuttgart, dedicated to the margrave of Baden (see the lower images), in Matematisch-Physikalischen Salon in Dresden and in Boerhaave museum, Leiden, Netherlands (see the upper image). The dimensions of the machine of Auch in Stuttgart are: 22,8 x 6,1 x 1,9 cm (the device in Leiden is bigger—28 x 8,0 x 4,0 cm), the weight is about 720 g. It is made of brass and is placed in a wooden case. The "Stuttgart machine" of Auch has 8 digital wheels, 7 of them are decimal, and 1 (the second from the right) is divided to 12 parts (the Leiden device is destined for another monethary system and has a 24 parts wheel). The graduation of the disks was made according to the monetary system adopted throughout the southern states of the Holy Roman Empire in 18th century (60 Kreuzer = 1 Gulden). The two rightmost wheels are used for calculations in Kreuzer (12 x 10), others (decimal) are used for Gulden. Entering of the numbers can be done by means of a stylus. At the lower left corner of the box is inscribed an instruction for work in German: use black to add and red to subtract. This means, that the internal calculating mechanism is unidirectional, the wheels can be rotated only in clockwise direction, and subtraction can be done, using the method complements of 10. The calculating machine of Auch has in improved tens-carry mechanism. This important constructional element of the machine used the so-called tens-carry-rail, which guarantees reliable tens-carry operations. 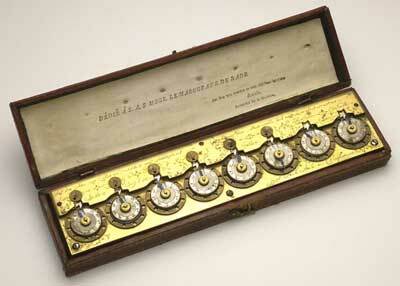 The machine also has a memory mechanism for storing numbers.